Color(s): Always solid with no markings; grizzle, black, gray, sandy brown, russet. Originating during the 1700's as a descendant of the Puli, this Hungarian breed was developed to drive cattle, sheep, and pigs. Pumi's were also used to guard farms and exterminate vermin. 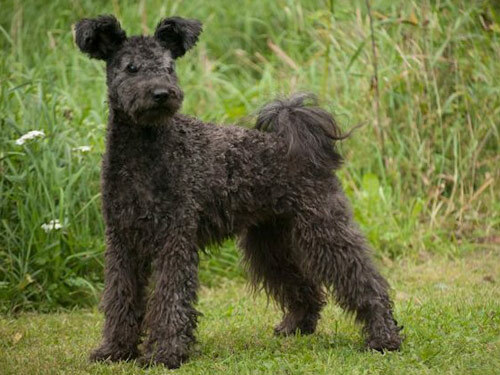 Considered to be the town dog of Hungary, the Pumi is relatively rare in North America. The most distinctive feature of the Pumi is the elongated muzzle. A hardy and sturdy sheepdog, this breed is often referred to as the breed who is "unable to keep quiet". Their consistent vocalizations make them excellent watchdogs. This Terrier type of herding dog is suited both for companionship and sport. The Pumi breed is affectionate with the family and has a cheerful disposition. They are typically timid and suspicious of strangers and this makes them a good watchdog. They do best in a home with older considerate children. Pumi's have a tendency to be dog aggressive. This breed is always alert, energetic, willful, and intelligent. The Pumi will become bored, lonely, and destructive if they do not receive sufficient attention or have a job to do. This breed is independent, extremely bold, always restless, and noisy. The Pumi requires weekly combing of the coat. Bathing should only be done when necessary. Professional grooming must be done every three months and removing excess hair from the ears is recommended. Due to the rarity of this breed and limited intervention by humans, the Pumi has no known health issues. The Pumi's double coat is of average length, thick, and curly. The undercoat is soft, but not velvety. The outer coat is harsh in texture. This breed sheds little to no hair. The Pumi's intelligence and ability to learn quickly makes them easy to train, although their stubborness can be a challenge. Early socialization and basic obedience are recommended. The Pumi breed must be trained with fairness, firmness, and consistency. Pumi's are not recommended for apartment living due to their high activity level and tendency to bark incessantly. They do best in a farm setting with work to do. The Pumi excels in fly-ball and herding. Pumi's enjoy playing a game of fetch and make good jogging companions provided they are securely leashed.